New RDX Removable Disk Cartridge expands family of RDX media for scalable backup, restore and archiving for small and medium-sized organizations. 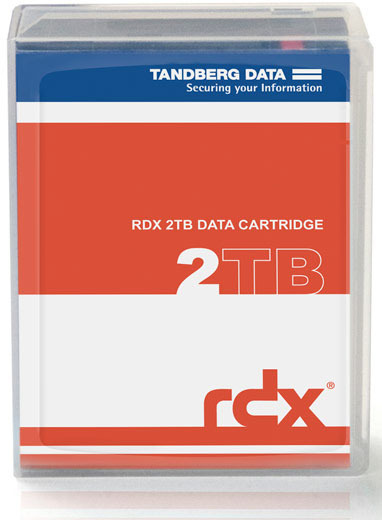 Tandberg Data, the developer of RDX removable disk technology, today announced that it has introduced the world's first 2 terabyte (TB) RDX data cartridge to its family of RDX data protection solutions. This is the industry's highest capacity RDX cartridge and increases maximum single RDX cartridge capacity by 33%. The new 2TB RDX cartridge benefits the entire ecosystem of complementary RDX solutions from Tandberg Data. For example, with the new 2TB RDX cartridge, customers of the RDX QuikStation removable disk array now have the ability to increase the system’s online capacity from 12TB to 16TB. Users of the BizNAS network-attached storage (NAS) appliance, which provides off-site disaster protection and bare metal recovery when attached directly to an RDX QuikStor, can protect even more data on fewer pieces of media with the new 2TB cartridge. This announcement underscores Tandberg Data’s commitment to investing in and advancing RDX technology to ensure reliable, affordable and simple data protection for our thousands of customers worldwide. The new 2TB RDX cartridge is available now through BackupWorks.com a Premium Platinum Level Partner. All RDX media ship with a three-year advance replacement warranty.